I am in my third year of the doctoral program in the Faculty of Social Work. My research is focused on factors that have determined the position of women in community development processes and ways of mainstreaming gender in those processes in Ghana. Community development involves the organization and mobilization of local resources, community members, local, national and international organizations, governmental and non-governmental organizations and other stakeholders within and outside the community to enable them take collective action on negative social indicators (social problems and issues) that concern them. My dissertation is titled “Gasping for Breath: Gender Issues and the Politics of Community Development in Ghana.” My work builds on my masters’ thesis, which focused primarily on stakeholder relationships and their effects on community development in Ghana. While doing my master's, I realized that the broader issues of gender and positional concern were significant factors excluding most women’s groups from engaging in the governance of community development in Ghana. At the same time, my masters’ study increased my understanding of the role that imperialism and colonialism played in sidelining indigenous people in community development processes in Ghana. In my quest for a greater understanding of women’s identities formed within a colonized context, I decided to narrow my research to study women, especially those in rural communities in Ghana, who are sidelined in decision making processes. Seeking to understand the broader issues that support or weaken women’s identities became an important driver for my research. In sum, I assume, based on my experience and the literature, that women have great potential which needs to be tapped to help develop rural communities in Ghana. My recent presentation at the Balsillie School of International Affairs event, On Africa: Graduate Student Research from the Waterloo Region, is part of my literature review for my thesis and shows how popular sayings and proverbs reinforce gender inequality in Ghana. I suggest that proverbs have discursive power, as they institutionalize the roles, statuses and identity of women in Ghana. I recommend that the linguistic resources in Ghana be revolutionized to help deinstitutionalize the existing patriarchal discourse and culture in Ghana. 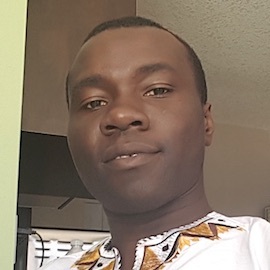 Charles Gyan is a student of Magnus Mfoafo-M'Carthy and Shoshana Pollack in the Lyle S. Hallman Faculty of Social Work.